Originally designed to deal with the inadquate penetration of the .45 ACP cartridge in the 1911 platform, the .38 Super occupies a distinct niche. First rediscovered by the competitive shooting community, it is gaining ground as a CCW cartridge with hollow point loads from companies such as Corbon and Wilson Combat. However, these boutique cartridges are far too expensive for target shooting. 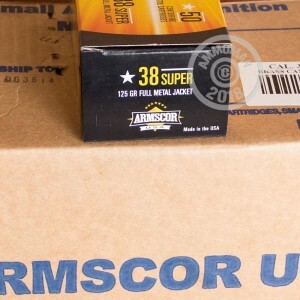 For shooters looking to get some range time with their .38 Supers, Armscor offers this load in boxes of 50. Armscor's load uses a 125 grain full metal jacket bullet and is loaded to relatively high pressures for full-size, all-steel 1911s. 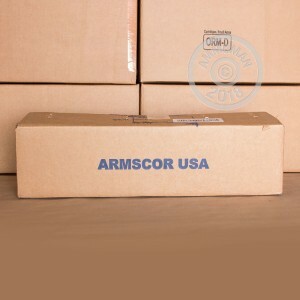 Each cartridge uses non-corrosive Boxer primers and reloadable brass casings. 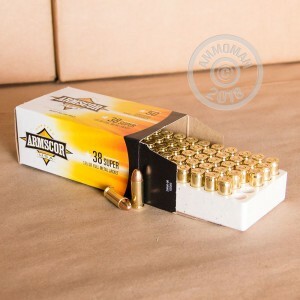 Armscor is a major manufacturer of ammo and firearms based in the Philippines and is best known to American shooters as the OEM for Rock Island Armory and other brands of 1911 pistol in .45 ACP and .38 Super. AmmoMan.com ships all orders over $99 for free. No hidden handling charges, no shipping calculators. Just buy in bulk and save!